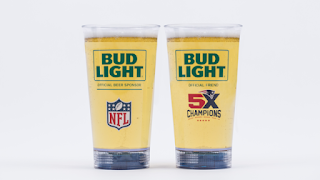 Ahead of the highly-anticipated NFL kickoff taking place Thursday, September 7th, Bud Light announced a line of “Touchdown Glasses” that will be given out to fans at Gillette Stadium ahead of the first NFL game against the Chiefs. The glasses come with a base attached designed to light up every time the Patriots score via in-stadium radio frequency technology. The glasses will also light up when the Super Bowl LI banner is raised in Gillette Stadium ahead of kickoff. Patriots fans are not the only football fans awarded the unique experience. The glasses will also be designed for the 49ers, Broncos, Colts, Giants, Jets and Raiders. The Touchdown Glasses are part of a Bud Light initiative to give consumers an enhanced experience wherever they are, be it in-stadium, out to eat, or in the comfort of their homes. This product not only enhances the experience, but also does it in an eye-catching manner that will attract others to the experience as well. Considering the Patriots success, I envision fans will see their Touchdown Glasses lighting up a good deal throughout the 2018 football season.